November is Adopt a Senior Pet Month and Pet Cancer Awareness Month. We’re addressing both topics with a more personal Vet 101. When we takes our cats to the vet they focus on our pets but vets are often pet parents too. They have the advantage of knowing how to diagnose and treat illness but even the best vets can’t cure every animal and a vet is not immune to heartbreak. 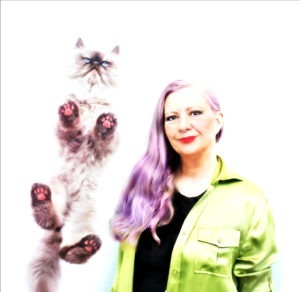 Dr. Letrisa Miller who regularly contributes to Vet 101, shares insights about treating her own beloved cat Squeaky and making difficult choices from a vet’s perspective. It’s adopt a senior cat month, and whenever anyone mentions senior cats my thoughts always turn to my cat, Platypus. A few years ago Platypus, Squeaky to close friends, was a thriving senior cat. She had a beautiful coat and was the picture of health. She didn’t look like a senior of 14 years. She loved her rocking chair and played there frequently. She got into mischief occasionally and kept the other cats in the household in line. She liked to play “dragon” in my young daughter’s play castle kingdom and knock over the knights and the castle walls. Mostly, though, she snuggled with her family at every chance.Her favorite thing was to sit on my chest and rest the top of her head on my chin. Or to sleep with her cheek on mine at night. She was the most lovable cat I have ever known. Everything was not as well as it seemed, however, and in the fall three years ago, I noticed that she was spending more time by herself and that she wasn’t eating quite as well as she had been. I kept examining her, but I couldn’t find much change other than some weight loss and a very mild increase in respiratory effort. Then she started vomiting.Her lab work showed no changes, but she was still losing weight. Her energy level was dropping rapidly. My heart was breaking watching the light of my life melting away before me. I thought she was having some trouble breathing, so I took radiographs. Her lungs looked like she might have a little bit of thickening around the bronchioles that was consistent with asthma or bronchitis. I consulted with other Drs. and they also were stumped. I started her on a steroid in the hope that her lungs would respond. I was afraid to anesthetize her for more invasive diagnostics because she had always had a heart arrhythmia and it made her a very difficult anesthesia patient when she had needed surgery in the past. Not long after she started vomiting her eating stopped. I couldn’t let her starve while I struggled to make a diagnosis, so I placed a feeding tube in her esophagus despite the anesthesia risk. A lung aspirate at that time did not show any evidence of infection or abnormal cells. She seemed happy that she didn’t have to make the effort to eat on her own and she seemed stable for a few weeks. Was she responding to the treatment I had started for asthma? Unfortunately, her improvement was short lived. She started to decline again. I found a mass on her leg near her foot. It was very small and didn’t seem to be bothering her, but I sent it for biopsy. The results came back to me as a terrible surprise. The histopathologist was a friend of mine and called me. He had found ciliated epithelial cells-cells found only in the lungs and trachea! He wanted to be sure that I had sent them a skin mass, but he knew that he was giving me very bad news. She had primary lung cancer with what is called lung digit syndrome. Lung digit syndrome is seen in humans and cats. It is a condition in which lung cancer spreads preferentially to the hands and feet and causes tumors to form, primarily in the fingers and toes. Most cats are presented for a non-healing, painful sore on a foot. It is often first diagnosed as an abscess and treated with antibiotics. When it doesn’t heal, further diagnostics are usually done. Often it is not recognized, though, even at this stage, and biopsy is often not done for some time. While lung digit syndrome is uncommon, it is something that is seen in older cats and should be considered in any cat that has a non-healing sore on a foot or lower leg. In most cases, the cancer in the lungs is fairly advanced by the time tumors start appearing in the digits. If lung cancer is diagnosed early, there is some chance that chemotherapy could be effective in treating the primary lung disease. Very little is known about treating lung cancer in cats and because it is uncommon prognosis is not known. My decision for Squeaky was a very difficult one, but after seeing that she was no longer enjoying anything in her life and that breathing was getting increasingly difficult for her, I decided not to pursue chemotherapy. She was attempting to hide whenever she got the chance and was telling me very clearly that she was ready to leave us so I decided to euthanize her. I still cry when I think of her and the years that I expected to have with her. Fourteen is so young for a cat to die! Many of my tears, though, are tears of joy and thankfulness for the 14 years that I did have with her. Her middle and late years were the best for us, with a well established and thoughtful relationship between the two of us. I try hard not to blame myself for not figuring out her illness sooner, but there is always just a little guilt. I know that Squeaky doesn’t judge me, though, as she was never a cat who held any grudge-ever. She was a very special individual and I see her in so many senior cats that I now treat. It is always such a joy to my heart to see something of her in a cat that comes to me for help. I am especially thankful that I have been given the opportunity to keep my senior patients living healthy and happy lives in their homes. Squeaky is always there with me in the exam room watching for subtle signs of illness so that early diagnosis might be possible. I miss her every day, even now, three years later. I wish I had been able to diagnose her cancer earlier, but diffuse cancer is nearly impossible to diagnose without tissue biopsy. It rarely shows on any other tests in a way that will give a definite diagnosis, and like in Squeaky’s case, it often looks like another disease. I miss my Platypus, who loved frogs and chin rubs, but I am thankful that she never really leaves my side. She makes me thankful for the profession I have and the ability that I have to help people and cats. She makes my job very real for me and keeps me focused on the love that exists between people and their cats. Oh, so very sad and a reminder. Squeaky was beautiful. I will remember this. Our boyz are only, but …. Thank you Dr. Miller for sharing. Thank you for sharing your story. Beautiful kitty. I had a Squeaky too. He was 21. Same coloring too. Reading this helps to ease my own guilt over not being able to see the changes in my young 14 year old Abby. If a Vet is stumped then none of us without that type of training should hold guilt over not diagnosing a condition sooner, or missing a subtle sign. We all wish we had the ability to know something so we could ‘fix’ it but with cat illnesses I am seeing sometimes that is impossible. Like Dr Miller, I will always be eternally grateful for the years Abby and I had, and like her, I wish we had more time. But what time we had could not have been better. People become veterinarians because they love animals, and they hurt just as much when their animal companions hurt, loss is no less painful, even with a better understanding than the average person. So sorry Platypus left so soon, thanks for sharing a little of your sad with us, sending purrs to you. Aww. God bless Squeaky. I had a few cats pass on when I was little. I was so sad. My WW entry is #88. Come by and vote for us? That’s a really pawsome tribute to Platypus. Of course it is a little bit sad, but very moving. It must have been very difficult for Dr. Miller but we can feel the presence of Squeaky in her words! They must have been very close the two of them. Thanks for sharing this wonderful but very touching story with me. It was written so well, that Squeaky won my heart after reading the first lines. Oh that makes me want to go hug both my 14 year olds! Thank you for sharing your story. That’s a very beautiful and sad story. Cats give us so much to be thankful for. My babies have taught me so very much in the time I’ve known them. I cannot imagine ever living my life without a wonderful kitty in it. If Dr. Miller is reading this, it is definitely not your fault that you didn’t catch the cancer. It sounds incredibly difficult to diagnose, and I’m sure your sweet kitty knows you did everything you possible could for her. What a saga. I’m so grateful to Dr. Miller for such a clear report, also filled with heart. Really helps, in this fearsome business called life/death. 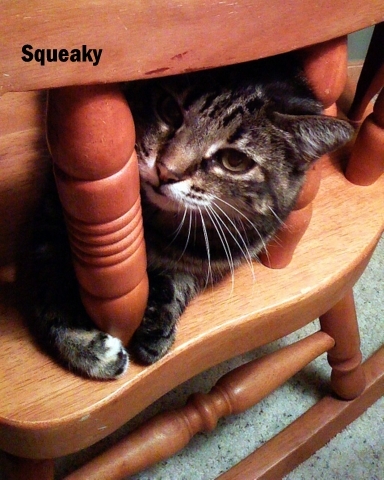 What a wonderful story about Squeaky. I remember helping the vets I worked with treat their own pets and cats. It was always so obvious how much they cared for them. And they always had a special place with me as well. Such a beautiful tribute and story of her sweet Squeaky. It’s easy to forget when we’re paying either a routine visit to the vet, or especially an emergency visit, that they walk in our shoes, they have heartbreak over their own beloved pets. No wonder their compassion has no boundaries. I admire them so very much.